I will never be without this toner ever again. I don't know what I was thinking; I went through an episode of having really hypersensitive skin last year & cut out everything I was using. I slowly began rebuilding a routine that was perfect for my combination skin & fell back in love with this toner... all over again! Whatever I combined this toner with was obviously not agreeing with me, but this toner alone, combined with my rosehip oil & PC's balancing moisturizer is a routine I will never ever change! My skin has been looking & feeling incredible with consistent use & has given me genuine, long lasting results. My skin barrier is stronger than ever, & I don't get breakouts anymore!... must be the grapeseed extract?? Paula’s products have been a mainstay for me for over three years; I’d be hard-pressed finding a replacement line. I don’t want to be without Paula’s Choice products. 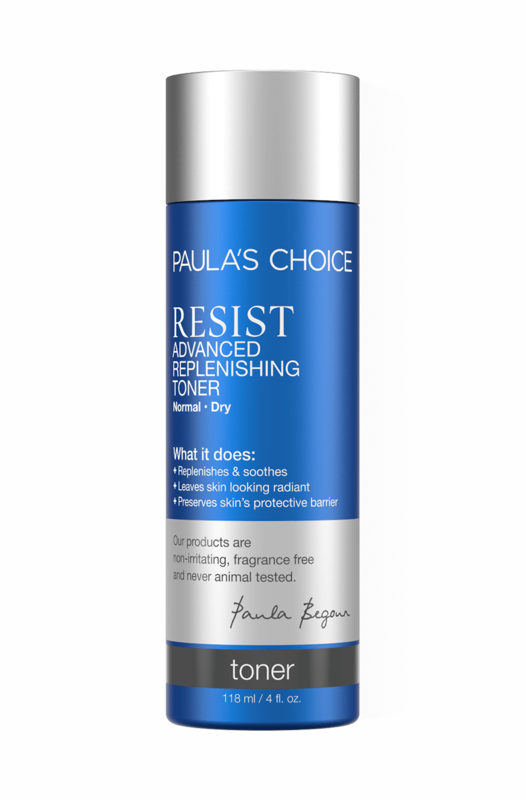 I’ve chosen the RESIST Advanced Replenishing Toner for my first written review. While I periodically use other Paula’s Choice toners, this one is the very best overall. I gently shake the contents of the toner before unscrewing the lid each time I use it. The ingredients inside are some of the best anyone can use on their skin. I want them all making it onto my face. I’ll sometimes use cotton wool to apply the toner after cleansing, especially when I’ve washed off make-up, sunscreen and an urban commute. More often I simply pool about two teaspoons or so of toner into one hand then use both hands applying the toner like an aftershave, lightly smoothing all over face and neck as well. The consistency of this toner works fine that way though I’ve had to practice a bit. The application of this toner alone after cleansing may well be enough at night for some people. If using the toner alone in the daytime, a sunscreen of SPF 30 or greater is a must. 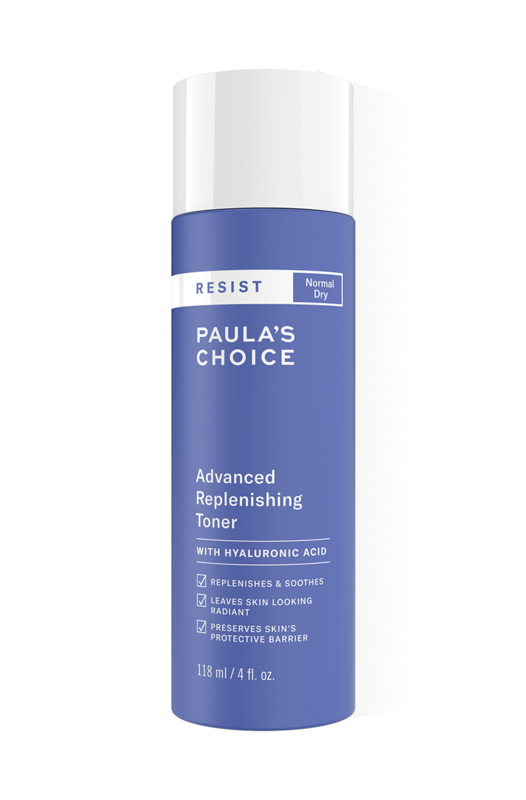 I typically use a Paula’s Choice exfoliant, booster or serum and moisturizer after cleansing and toning. I’ll write about those in their appropriate section. Hello Jenny, thank you for sharing your experience with us, we are always delighted to hear from our customers! This is an excellent toner. It left my skin feeling moisturised and comfortable. So I bought the trial size that lasted for about 3 weeks despite being used twice daily and I think that's value for money. I liked the toner, don't get me wrong but not enough to repurchase. That said, it did help me realise the need and place of toners so I have ordered a full size of one of the other PC toners. Not bad but I wouldn't use again, let me just qualify that by saying I have not ever been a toner user. I am now, just not this one. Michelle - Where have you been all my life? I have never believed in toners - I never saw the point. I swayed from this position when I saw my favourite Aesthetician raving about this product on YouTube. She was saying that that it gives a glow and radiance to the skin, and that when she ran out of the product, her skin's luminosity soon took a dip. That was enough to convince me and I ordered promptly. Turns out, this toner did not disappoint one bit! I am 40 and have very dry, lacklustre skin, despite eating healthy food, exercising and using the finest products known to man. It only took a use or 2 of this toner to start seeing a remarkable difference in brightness and clarity and it immediately won "can't live without" status in my skincare regimin. I would seriously recommend this bad boy. It's worth every penny! Ever heard of the 'devil's 3 seconds'? I have. Experienced it too, I think. I heard it first on some beauty show from Korea and it means the first 3 seconds right after towel drying your face from a wash. During these 3 seconds while the pores are still open, it is crucial to moisturise to prevent your face turning taught and dry. Where I say I've experienced this, I mean, I find that my face turns taught and dry very quickly right after drying my face if delay splashing some sort of toner on it. And that time seems to be as short as 3 seconds. Anyway, while some toners seem to evaporate just as quickly as you slap some on, this milky toner with a very runny jelly-like consistency tends to stay on my face quite well, and most of all, VERY moisturising. On first use, I even thought about leaving the skincare routine there for the night since it was quite 'quenching'. Also good at calming down irritated skin. Am a fan. I haven't used toner for years but as I get older I decided that I need to take more care of my skin. After receiving a sample of this Toner I went ahead and bought a full size bottle. You only need a few drops on a cotton pad for your whole face and neck, so it will last ages. It's lovely, cooling and refreshing and definitely makes my skin feel nicer and ready for moisturing. It has a lovely, silky feel to it and soaks into your skin quickly. I have bought other, cheaper toners in the past but will definitely be sticking to this one from now on. In my opinion this product isn't worth the price: the container is quite small and therefore I find that with daily use the product runs out quite quickly, and I haven't noticed any benefits to my skin. Having said that, I acknowledge that I may have chosen the wrong toner for my skincare needs as I don't have mature skin, but I bought it based on the fact that it apparently calms redness. I can't say I've noticed any improvement to my normally slightly red cheeks, nose and chin. Ultimately this was an inoffensive but fruitless purchase for me. This feels soothing and calming on my skin - easy enough to apply it with fingers, you don't even have to use a cotton pad. Has a lotion texture which soaks in quickly and leaves my combination skin rebalanced. This toner gets my skin feeling in perfect condition for the rest of my routine. It softens my slightly drier cheeks and preps my slightly oily t zone for my spf. Its packed for loads of antioxidants as well and free of irritants, what more could you ask for! I purchased this product, along with the Paula's Choice Resist Intensive Wrinkle Repair Retinol Serum, and I have been using both for over five weeks now and have noticed no discernible difference in my skin whatsoever. If anything, my skin seems slightly more irritated and prone to spots. Although these products are by no means the most expensive, it still felt like an investment at £55 for the two. Since having both my children, my skin has gone from good to tired-looking, blotchy, bumpy and haggard. I was desperately seeking a skincare regime that would help alleviate some of these problems and the reviews of Paula's Choice products generally, seemed very good. I really wanted to like the Resist products and I have persevered with them, but sadly, they don't seem to work at all for me.Customer Care: Thank you for your review. We are sorry to hear that you haven't seen better results. Please contact our Customer Care Team so we can help you find products that may work better for you. This is a fantastic product - really cuts irritation and is pretty economical if you apply with your hands. No alcohol, fragrance or anything ridiculous to make it problematic. However, since PC UK uses Yodel to deliver to the UK, I'll reduce ordering from this site to a absolute minimum as actually getting the product delivered is more hassle than its worth. I'll try the new Clinique essence stuff to see if its a dupe I can buy locally. Can't find a dupe of the wonderful azalaic acid stuff PC do, unfortunately and that stuff is amazing. I don't often write reviews, but this product is so good. Skin feels lovely and it has really helped with my redness. Only one small criticism - wish they did larger bottles. This stuff is amazing...calms my skin like nothing else i have ever tried...and most important. ..no breakouts!!! I have hunted high and low for years for products that do not upset my skin...I finally found them here...so happy. Please don't EVER change the formula...many thanks! I bought this toner along with the other RESIST products and I have to say that I love this toner! One of my main gripes with the RESIST line is the "less for more" rule they seem to follow. You only get 118ml of product but the consistency of it, akin to milk, more than makes up for this. Due to its consistency this toner spreads easily across the entire face and neck and you don't need to use a lot at all! It leaves the skin feeling dewy and doesn't leave any shine either. After using this, my skin seemed to have a radiant glow about it! Truly a five star product! I have just ordered a second bottle of this toner. It's simply an oustanding product. It glides on smoothly and sinks in without leaving any residue. I have a combination skin and find that it balances it perfectly. During the warmer months, I found it was often enough on its own for moisturising my skin. Now, in the colder weather, it's still going strong and I haven't needed anything more than applying a sunscreen or serum on top. I have normal/combination skin and whilst the RESIST line (and Paula's Choice products in general) have significantly improved my skin, this is a standout product. As Eric writes, the texture is milky and slightly thicker than other PC toners and applying after a shower instantly rehydrates and smoothes skin. It is soft to apply, absorbs quickly and leaves a noticeable difference in skin tone - this product could easily be worn alone under sunscreen if you have my skin type. Top marks!